The main difference between Bombay blood group and O blood group is that the Bombay blood group lacks H antigen in their red blood cells whereas O blood group contains the highest amount of H antigens among all blood phenotypes. Furthermore, the Bombay blood group is the rarest blood group among humans whereas the O blood group is the most common blood group in most populations. Bombay blood group and O blood group are two types of blood group phenotypes found among humans. The Bombay blood group is often mistakenly identified as O blood group. Bombay blood group is the rarest blood group among humans. It is characterized by the absence of the H antigen on the red blood cells. The other names for the Bombay blood group are the hh blood group or Oh blood group. This blood type was first discovered in Bombay (Mumbai) in India Dr. Y. M. Bhende in 1952. This H deficiency is rare among populations; it occurs in 1 of 8,000 in Taiwan, 1 of 10,000 in India, and 1 per million in Europe. The H antigen serves as the intermediate substrate in the synthesis of ABO blood group antigens. Moreover, the enzyme responsible for the production of H antigen is fucosyltransferase. The human genome encodes two forms of fucosyltransferases in two different loci. They are the H locus and the Se locus. The H locus contains the FUT1 gene and the production of the H antigen requires at least a single copy of the functional gene. The Bombay blood group occurs when both copies of the FUT1 gene are inactive (h/h). This causes the production of anti-H antibodies in the plasma. The Se locus contains the FUT2 gene expressed in the secretory glands. The production of H antigen in the saliva requires at least a single copy of the functional gene. Inactivation of both copies of the FUT2 gene produces the Bombay blood group. This causes the production of anti-H antibodies in the saliva. In addition to the production of the ABO blood group antigens, the H antigen also plays a role in cell adhesion. The H deficiency does not produce any deleterious effects, but an H deficient individual requires another H deficient individual for blood transfusion. The O blood group is the commonest blood group among the four common blood groups of humans. It is characterized by the presence of unmodified H antigens either into A or B antigens. It occurs in 44% of Caucasians, 49% of the Blacks, and 43% of Asians. The biosynthesis of A and B antigens from H antigen requires a series of glycosyltransferases, which transfer monosaccharides to produce oligosaccharide chains attached to the proteins and lipids on the plasma membrane of red blood cells. The A allele encodes a glycosyltransferase, which produces the A antigen while, B allele encodes a glycosyltransferase, which produces the B antigen. However, the type of glycosyltransferase encoded by the O allele is inactive; hence, it is unable to produce either A or B allele. Thus, the H antigen of the O blood group remains unchanged. 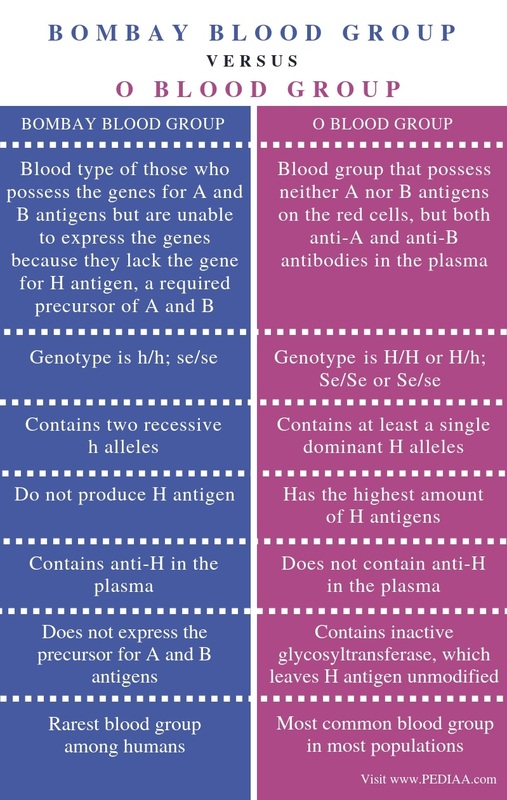 Since H antigens in the O blood group are not converted into either A or B antigens, it contains the highest amount of H antigens among the ABO blood group. Bombay blood group and O blood group are two types of blood phenotypes that occur among humans. They are distinguished by the presence or absence of the H antigen on the red blood cells. The H antigen serves as the precursor for the production of A and B antigens. The H antigen is encoded in two loci in the genome: the H locus (FUT1) on chromosome 19 at 19q13.3 and the Se locus (FUT2) on chromosome 19 at 19q13.3. Also, both blood groups do not express A and B antigens on the red blood cells. Therefore, both blood groups contain anti-A and anti-B antibodies in the plasma. Bombay blood group refers to the blood type of those who possess the genes for A and B antigens but are unable to express the genes because they lack the gene for H antigen, a required precursor of A and B. People with this blood type frequently have anti-H in their blood. 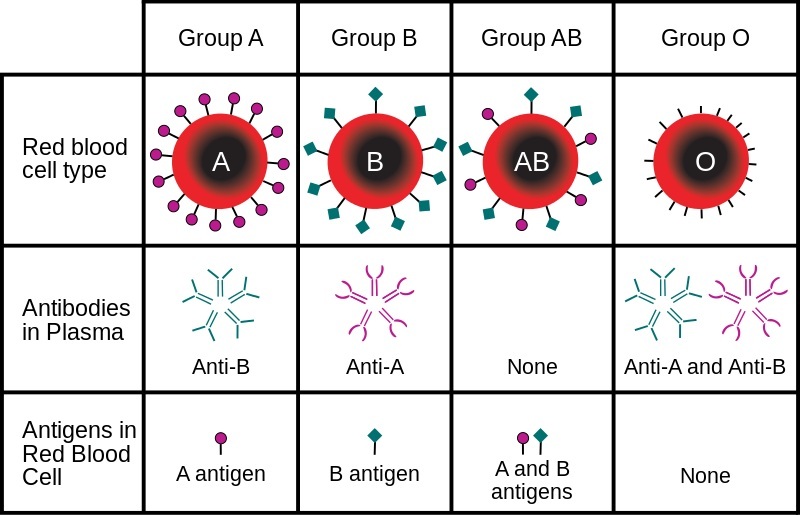 In contrast, O blood group refers to the blood group that possess neither A nor B antigens on the red cells, but both anti-A and anti-B antibodies in the plasma. This is the main difference between Bombay blood group and O blood group. The genotype of the Bombay blood group is h/h; se/se while the genotype of the O blood group is H/H or H/h; Se/Se or Se/se. Another difference between Bombay blood group and O blood group is that Bombay blood group contains two recessive h alleles while O blood group contains at least a single dominant H alleles. Presence or absence of H antigens is the major difference between Bombay blood group and O blood group. Bombay blood group do not produce H antigen while O blood group has the highest amount of H antigens among the blood groups. Furthermore, Bombay blood group contains anti-H in the plasma while O blood group does not contain anti-H in the plasma. 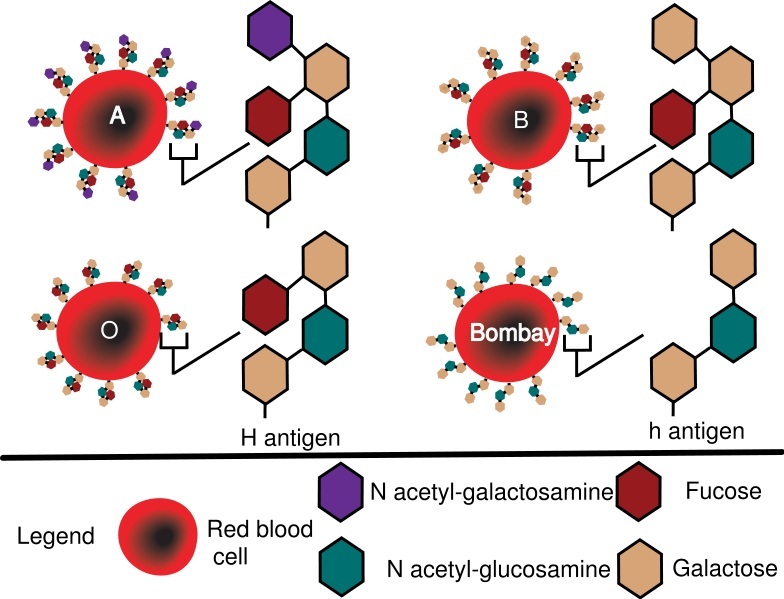 Bombay blood group does not express the precursor for A and B antigens while O blood group contains inactive glycosyltransferase, which leaves H antigen unmodified. Bombay blood group is the rarest blood group among humans while O blood group is the most common blood group in most populations. This is another major difference between Bombay blood group and O blood group. Bombay blood group is the rarest blood group among humans and it mainly occurs among Indian and Taiwanese populations. The main characteristic feature of the Bombay blood group is the H deficiency. Therefore, the blood plasma of those individuals contains anti-H antibodies. On the other hand, O blood group is the commonest blood group among most populations. The H antigen of the O blood group remains unmodified either into A or B antigens. Therefore, the blood plasma of these individuals contains anti-A and anti-B antibodies, but not anti-H antibodies. The main difference between Bombay blood group and O blood group is the presence of H antigen.